JAKARTA, Dec 5 2014 (IPS) - Last week, Indonesia’s new president, Joko Widodo, ordered the country’s Ministry of Environment and Forestry to review the licenses of all companies that have converted peatlands to oil palm plantations. If the ministry follows through, this will be one of the most important actions the Indonesian government can take to begin truly reining in the destruction reaped by the palm oil industry there – and to address the severe climate impacts of peatland destruction. The Indonesian Forum on the Environment, known as WALHI/Friends of the Earth Indonesia, has been pushing for this initiative, and the announcement was made in the village of River Tohor, in Riau Province, where WALHI has long worked with the community. Walhi had invited Jokowi, as the president is casually known, to come to Riau because the province is ground zero for Indonesia’s massive haze crisis that comes from the near-constant burning of carbon-rich peatlands in order to convert these fragile ecosystems to plantations. “We invited him to River Tohor to demonstrate the community’s success in preserving the peat forest ecosystem,” said Zenzi Suhadi, forest campaigner for Walhi. “We hoped this visit would show the president that community management can protect forests, and that granting concessions to companies is the wrong approach,” Suhadi said. 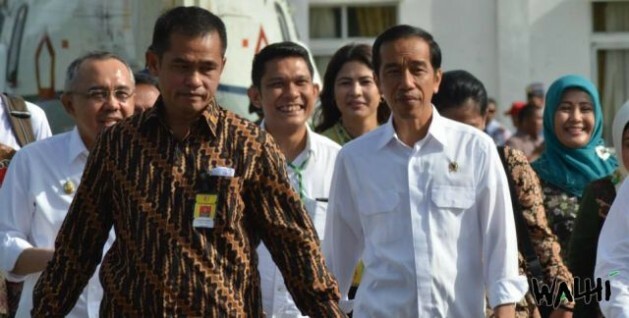 The strategy appears to have succeeded, as Walhi hailed President Jokowi’s Riau visit as proof of his commitment to solving ecological problems. Peatlands – waterlogged vegetable soils that make up a significant portion of Indonesia’s rainforests – are great storehouses of carbon dioxide. The widespread practice of draining and burning peat to develop palm-oil and other plantation crops makes Indonesia the world’s third largest emitter of global warming pollution, after China and the United States. Taking strong measures to prevent this practice may be the single best action Indonesia can take in the fight to curb the climate crisis. Palm oil producers have fought long to preserve the ability to clear peatlands. When Wilmar International, among the world’s largest palm oil traders, announced last year that it would stop trading palm oil grown on cleared peatlands, some suppliers pushed back, saying it would not only harm the industry, but would set back the economic development of smallholder farmers. Jokowi appears to have taken the economic argument to heart: he made the announcement to audit palm oil concession licenses after joining the local community to plant seedlings of sago, a native palm species that is harvested for its starchy tapioca-like pith, a food product that can be sold locally or for export. “The president’s decision to audit concession licenses to protect peat puts the interests of citizens ahead of the interests of the industry,” said Suhadi. The move also comes on the heels of Jokowi’s announcement that the Ministry of Forests and the Ministry of Environment would be combined into one ministry, headed by Siti Nurbaya – a move that not all see as positive but that does signal a radical effort to restructure the way the government manages lands and resources. Jokowi has also pledged to clean up Indonesia’s notoriously corrupt forestry sector as a step toward reducing deforestation. Walhi Executive Director Abetnego Tarigan says the president must soon follow up the visit with “concrete actions” in the form of firm law enforcement. “Among the concrete actions that President Jokowi can immediately take is ordering the termination concessions for companies proven to have been involved in forest and land fires,” Abetnego said. “Law enforcement must continue legal action against companies that have been named suspects, as well as develop investigations into companies that civilians have filed reports against,” he added. The environmental and social degradation caused by the palm oil is founded upon corruption and illegality, Walhi argues. “In order to begin restoring forests and returning rights to the people,” says Suhadi, “the large companies need to be the first target of the government. President Jokowi needs to streamline the ability of law enforcement to take action against these companies as part of a national movement to reclaim citizen’s rights to lands and livelihoods. It appears that, after decades of growing corruption and the massive deforestation, climate pollution and social conflict that has followed from it, Indonesia’s new president may be serious about bringing much-needed change.